Iceberg mania briefly overtook the internet last month when NASA captured a rectangular freakberg. But icebergs are with us all the time, and there’s a new animation to help you celebrate them in all shapes and sizes. Climate visualization specialists Pixel Movers and Makers have taken more than 40 years of data on the migration of icebergs and set it in motion, showing ‘bergs spinning off Antarctica and into the ocean at an increasingly alarming clip. Icebergs form on the regular in Antarctica. Sometimes, they’re spectacular like the recent sheet cake-like one, or the Delaware-sized hunk that broke off Larsen C ice shelf last year. Other times they’re anonymous hunks of ice or, if they’re big enough, given names by the National Ice Center so they can be put on navigation charts. But once they’ve broken off the glaciers and ice shelves that ring the Antarctic, they’re prone to the vagaries of ocean currents and the prevailing winds like a toy boat dropped in a pond. With the advent of satellite technology in the 1970s, their paths have become easy to track around Antarctica. And that’s the data used to create the new animation. “The data encompasses both named bergs and other bergs large enough to be tracked by spaceborne scatterometer instruments,” Marlo Garnsworthy, one of the founders of Pixel Movers and Makers, told Earther in a Twitter direct message. The animation reveals that icebergs often travel in a counterclockwise circle around Antarctica, with a current that largely mirrors the coast. The Antarctic Circumpolar Current sits just beyond that, and occasionally an iceberg manages to get caught up in it and shot out into the ocean. The Antarctic Peninsula—which sits between west and east Antarctic and reaches toward the tip of South America—can also act as a slingshot in some ways. As icebergs run up its eastern side, they curl out into the open ocean through the Drake Passage. That’s the route Iceberg B-15, the biggest (reference state: Connecticut) to ever break off the Ross ice shelf, took as it meandered out to sea in 2000. It remnants are likely to meet their maker (the ocean) this year. The peninsula also happens to be home to some of the hottest iceberg action on the continent. There’s a notable uptick in ‘bergs there owing to the fantastical breakdown of the Larsen B ice shelf in 2002. But while those are the most eye-catching moments in the animation, the speed up of ice loss is also telling. The Antarctic has shed 3 trillion tons of ice since 1992. Much of that has come from warm water undercutting ice shelves and glaciers, causing them to thin. But the breaking off of icebergs plays a role too, particularly on glaciers that are already weakened. 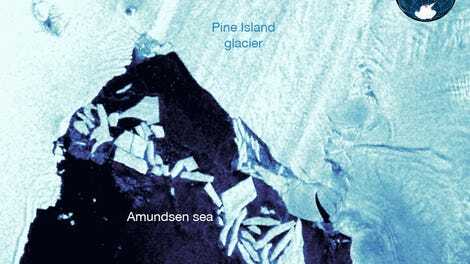 That includes the behemoth Pine Island Glacier, which has been calving icebergs at an alarming rate in recent years as it shrinks and warps. That means Pixel Movers and Makers will, unfortunately, have some more tracks to add to their map sooner rather than later.